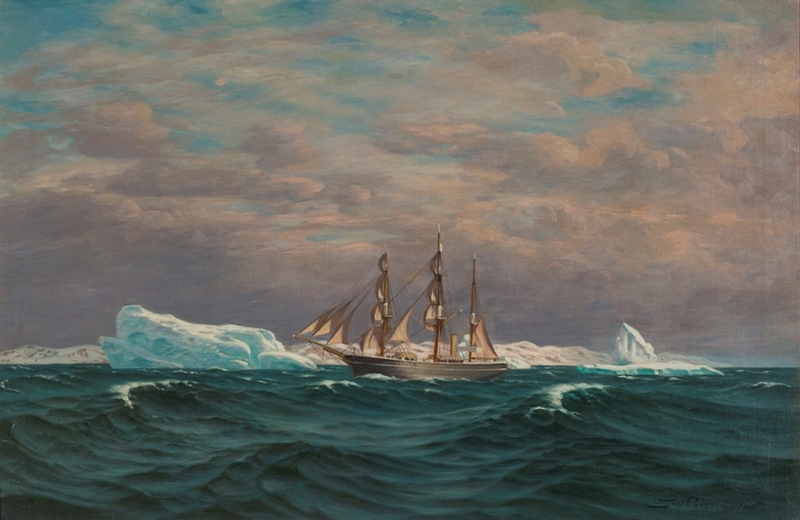 A three-masted ship unfurls the sails amid icebergs, with mountains visible in the distance. The ocean, with its rough and foamy waters, takes over the whole foreground. It is the steam schooner “Fox II”, perilously sailing probably just outside of Ivittût in West Greenland, as the ship belonged to the cryolite company of Ivittût. The painting was made by the Danish artist Andreas Riis Carstensen (1844-1906) sometime after 1893. “Fox II” was built in 1893 for the cryolite company and sailed for the company for 30 years. In July 1924 the ship was named “Grønland” (Greenland) and sailed to the East Coast of Greenland with Einar Mikkelsen as captain, establishing the Danish colony of Scoresbysund. Later that year the ship was bought by Grønlands Styrelse (the administrative organ for Greenland), renamed “Gustav Holm” and went on to sail between Greenland and Denmark until 1950. Andreas Riis Carstensen went to sea after his confirmation and started drawing onboard. Once back in Denmark he learned seascape painting from the marine artist Carl Dahl (1812-1865), and was trained at the Royal Danish Academy in Copenhagen from 1864-68. Throughout his artistic life he made numerous travels, from which he got his subjects – as is the case for the travels to Greenland in 1884 and 1888. Nuuk Art Museum has five paintings by Andreas Riis Carstensen, images ranging from a prosaic recording to romantic and nostalgic visions of Greenland. The ship in this painting is placed in the background, besieged by the icebergs and mountains. The foreground is dominated by a depiction of the sea. The painterly rendition of the sea, compared to that of the sky, seems thoroughly studied and detailed. Riis Carstensen painted a vivid ocean, with white horses and effects of lights and shadows. As you look at it, you can almost hear the ocean. Riis Carstensen first travelled to Greenland in 1884, by request of J.A.D. Jensen. Jensen had some nunatak’s (montains emerging from beneath the inland ice) named after himself, and his expedition on Greenland’s ice cap had been painted by the artist J.E.C. Rasmussen; Rasmussen’s painting (Kornerup på Isen, or “Kornerup on the Ice”) is exposed in Nuuk Art Museum. In 1888 Riis Carstensen travelled to Greenland once more and on his way back to Denmark sailed onboard the brig “Peru” – the same ship J.E.C. Rasmussen would fall overboard from and drown five years later. Both of the travels, in 1884 and 1888, were described by Riis Carstensen in the book Two Summers in Greenland. He wrote that the book came into being because of the interest about the Arctic in Europe. Many had unanswered questions, only few knew anything and even fewer had the possibility to travel there. In the book he described his encounter with Greenland, its people and their culture, and tried to give his view on this area in the Arctic. Riis Carsten painted in the 1890s a series of paintings from Egypt, commissioned by the Danish brewer, entrepreneur and art collector Carl Jacobsen. The seascape of “Fox II” was painted after his travels to Greenland, between 1893 and his death in 1906. He never saw this ship in Greenlandic waters but might have seen it in Denmark. However, he did see another of the cryolite company’s ships off the coast of Greenland, on his journey in 1884 – that was the schooner “John Franklyn”, on its way from Ivittût to Denmark.